Supply Chain News: Could Low Natural Gas Prices Drive Manufacturing Renaissance in Midwest? Supply Chain News: Could Low Natural Gas Prices Drive Manufacturing Renaissance in Midwest? Supply Chain News: Could Low Natural Gas Prices Drive Manufacturing Renaissance in Midwest? Chemicals, Fertilizers and Other Sectors Finding Midwest will be Low Cost Region; A Virtuous Cycle Developing? Drive along the Ohio River towards Youngstown, just west of the Pennsylvania border, and you will pass what seems like an endless stream of abandoned or nearly abandoned steel mills, with what look like equally dismal small towns usually surrounding the ghostly factories. Every now again, a few whiffs of white smoke emanate from a facility, giving perhaps a sign that some level of activity is still going on. Allegheny Technologies is building a new $1.1 billion metals mill, set to open in 2014. The new plant will burn a huge amount of natural gas, giving it a key advantage against global competitors. This scene is one of the bleakest landscapes in the so-called Midwest "rust belt," but far from the only one, as hundreds od manufacturing plants and the millions of jobs that went with them left in recent decades over high production costs, offshoring, over-capacity and more in Michigan, Ohio, Indiana, Wisconsin and other areas of the region besides Western PA. However, is it just possible that low natural gas costs and increasingly abundant supply as far as the eye can see will lead to a rust belt resurgence? The answer just might be Yes. The proximity to this vast energy source is suddenly making the broad Midwest the world's low cost location for industries that use lots of the resource. That is in part because natural gas is expensive to liquefy for shipment via ocean ships. In local regions like the Midwest, it can simply be piped to where it is needed from production sites at very low cost. 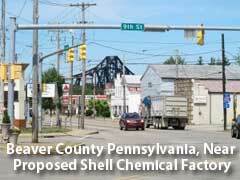 Case in point: Royal Dutch Shell is actively considering a new multi-billion chemical plant in Beaver County in Western PA, not far from the closed steel mills along the Ohio River. The proposed site of the Shell facility actually holds one of the few big factories still operating in the area, an 80-year-old zinc plant slated for closure next year. Shell is currently in negotiations with state officials over the plans. The plant would take ethane gas (a byproduct of natural gas in shale) and convert it into ethylene, the first step in making many plastics. That ethane would come directly from the Marcellus shale deposits nearby. If the project goes forward, it would be the first such plant built in the US in more than a decade. Meanwhile, the fertilizer industry is also eying the Midwest and its vast natural gas supplies, as it uses vast quantities of natural gas to produce some products. According to a Wall Street Journal article, between 1998 and 2004, US fertilizer producers shut down more than two dozen US factories, which represented close to half of U.S. capacity. Some facilities were literally taken apart and shipped overseas, where gas and labor were cheaper. But in September, Orascom Construction Industries, an Egyptian firm, announced plans for a $1.4 billion fertilizer plant in Iowa. It appears to be the first large-scale fertilizer facility built in the US in more than two decades. Meanwhile, another fertilizer maker, CF Industries, says it is planning to invest up to $2 billion through 2016 to expand it US production capacity. While chemical and fertilizer companies use natural gas as a raw material, other manufacturing sectors, such glass and steel makers, are big natural gas users for basic energy to power their factories. Energy can account for anywhere from 10% to 20% of costs in metals production, enough that the decline in gas prices could give the Midwest or the US overall a significant cost advantage. For example, the Wall Street Journal also reported that not far from few Beaver County, Allegheny Technologies is building a new $1.1 billion metals mill, set to open in 2014. The new plant will burn a huge amount of natural gas, giving it a key advantage against global competitors. The scenario could create a virtuous cycle. The demand for natural gas will continue to spur development of natural gas sites. Energy industry expert Daniel Yergin and others from the researchers at IHS issued a report last week that predicted close to $3.0 trillion in capital expenditures will take place between 2012 and 2035 in unconventional natural gas activity â€“ much of it in the Midwest. They predict another $2.1 trillion in capital expenditures will take place between 2012 and 2035 in unconventional oil development. Meanwhile, the growing use of cheap natural gas should drive up production of turbines for gas-fired power plants. The US' natural gas advantage is also causing the chemical industry to slow or even reverse what was a trend toward moving offshore in areas outside the Midwest. Now, Dow Chemical, Chevron Phillips Chemical Company and others have announced plans to build multibillion-dollar chemical plants in Texas, Louisiana and other states. "I never would have expected that as a region we'd have a second chance to be a real leader in American manufacturing," Bill Flanagan of the Allegheny PA Conference on Community Development, a regional business group, recently told a local business group, according to the Wall Street Journal. "Suddenly we're back in the game." Could low cost natural gas drive a resurgence of manufacturing in the rust belt? Let us know your thoughts at the Feedback section below.